Anxiety besets us all, but when you’re the parent of a child with PWS, you get beset by their besetting too. We had a seemingly simple task to complete after school today: an eye test. It took 80 minutes of cajoling, coaching, explaining, shushing and minor reprimanding. It resulted in an eventual victory with a side order of tactical retreat. But it’s the first time in Dry January that I’ve been sorely tempted to get wet. My girl was a bit tired after a busy day. She was in a questioning mood, which can be either endearing when well-timed or exasperating when not. But what sucked up the time today was her obsession with the details. From the moment we arrived at the opticians, I knew the path to glasses was going to be labyrinthine. Firstly, she started talking about having to pay for her specs now she’s over 18. She’d overheard me saying something about it to her dad earlier (from a distance of one floor and three rooms away, thanks to her bat-like hearing). So she wanted to announce it loudly in the shop - I think essentially just to show off to staff and other customers about being an adult - and she did. 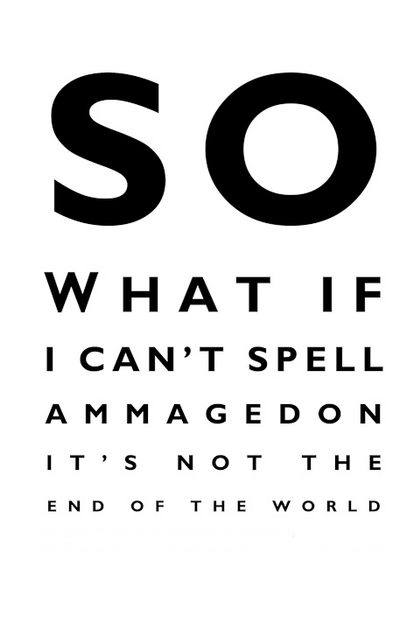 Many, many times, before, during and after the eye test. The optician was given both sides of my daughter’s all or nothing conversational skills. When asked to read out the letters, my girl stared into space, day-dreamed, looked like she might actually fall asleep at one point, but mainly uttered each letter in-cred-ib-ly slow-ly, with in-cred-ib-ly long pauses between each one. She seemed to be struggling, but there’s this detective game that needs to go on, in assessing whether she is really looking where she’s supposed to, whether she’s just taking her time because processing things does take her longer than most other people, or whether she’s just saying she can’t see very well because she fancies a new pair of glasses. It’s a challenge. On the other hand, my daughter sped up, dramatically, at exactly the wrong times: whenever the optician wanted to explain anything or give her instructions, instead of deliberations and pauses, my girl unleashed a non-stop barrage of circular statements and questions at the optician, at me, and even at herself. It took patience and time to get through the test. And the optician did remarkably well not to lose the will to live, because I very nearly did, and I’m the mum. But it then took forever as she began to get slighty panicky and very question-spewy at pretty much everything the assistant was saying about lens types, coatings, sizing, price, offers, expected delivery, and there might have been even more stuff but I couldn’t bloody hear because my daughter wouldn’t bloody shut up! We left, past tea time (I blamed myself for a booking a dangerous appointment time). I’d declined to sort out the free second pair offer - that could wait until another day when I’d had chance to charge up my resolve, and she’d got some food in her belly. I forked out a vision-blurring amount of money, and we headed home. And I had that thought, that selfish thought that I sometimes have, and hate myself for. I wished things were different. Simpler. That my 19-year-old girl could get herself kitted out with new specs like any other typical 19-year-old. She’ll do something atypically delightful tomorrow, I know, that will make me laugh, and make me grateful and give me the joy that only she sparks. And my ugly wish will melt away. Because it is ugly. (It’s just struck me how weird it is how it sometimes surfaces over small things like an eye test - compared to the hospital scans and operations this is easy, beginners’ level stuff). Wishing she didn’t have PWS is pointless and reductive and I can’t wish it really, it’s not fair, because she wouldn’t be her, she wouldn’t BE without it. But I’ll know I’ve wished it all the same. Writer, music lover, and mother to a girl with a rare genetic condition called Prader-Willi Syndrome (PWS). This blog will tell our story. With added music. And jokes. Well, it's either this, or I'll have to express it through the medium of interpretive dance, and no-one wants that. The condition is a chromosome disorder which affects the part of the brain which controls appetite, growth, and sexual development. Although too weak to feed as a baby, children with PWS grow to have an insatiable appetite, and never physically feel full up. But because their bodies can't convert fat to muscle efficiently, they have to be on a strict diet, for life. If their food intake isn't controlled, they will suffer from life-threatening obesity. People with PWS are of small stature, have some form of learning disability, are unable to have children, and are unlikely ever to be able to live an independent life. Oh, and by the way, there's no cure. Skirky - All These Little Pieces.